In the summertime, our shop can be very busy with our normal customers and tourists on vacations or students on summer break. This summer Fromagination put together a teenage staff to help in the shop and business office. Four of this summer’s teenagers were actually trained and suggested to Fromagination by the Youth-Business Mentoring program at Common Wealth Development. Those mentors start the students with a intensive three week pre-employment training, followed by a job placement with a supportive business. They begin by teaching teens how to effectively find, apply for, and interview for jobs. They also educate youth about financial management with field trips and guest speakers. After a student successfully completes the training, she/he is placed in a real-world job. Together with their workplace supervisor, the Common Wealth mentor assists participants during their work placements, focusing on how to keep and excel in a job. This double-mentoring ensures a youth has the support she/he needs to make the most of the employment opportunity and overcome problems that may arise in a first job. Shariah, who started this summer, says working at Fromagination is a great first job. She also likes working with all her coworkers. One bonus she says is meeting people from all around the world who come to the shop, and, of course, learning and trying cheeses. Once she graduates she thinking of becoming a CNA or chef and attending a historically black college or university. Shariah thinks “To live the best life is to live the cheese life.” Shariah and the rest of the teen staff operates the booth at downtown Madison’s Concerts on the Square, which is her favorite part of the job. All the teenagers help with the Concerts, a six-week Wisconsin Chamber Orchestra event on Wednesday evenings. Different food booths offer meals for anyone attending the concerts. The teenagers staff and sell from Fromagination’s booth and everything has to be quickly organized and set up – their end goal is to sell out. Everything has to be calculated correctly from the number of, and popularity of, Fromagination’s sandwiches to boxes and other food items. The team coordinates that each time and its personal sell-out record this summer is two hours! The rest of the teenage staff, Brady, Matthew, Tamia, and Poetry, have helped in various ways. Brady is in charge of the Concerts on the Square booth and makes sure everything runs smoothly. Matthew gets everything organized and a counted for the booth. Tamia’s hard work has earned her the title of “Cheesemonger” and makes her a big help in the shop. Poetry helps in the office with writing blog posts (like this one!) and fixing small things on Fromagination website. 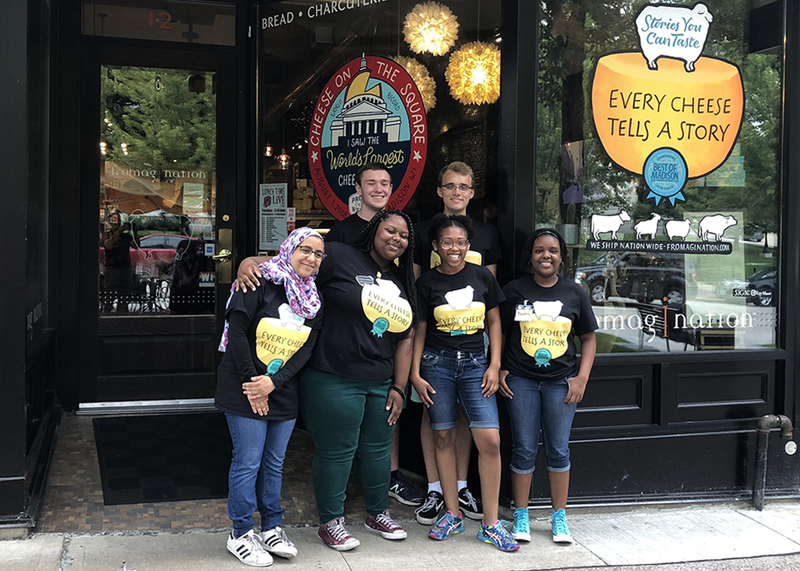 Stop by the Fromagination shop to meet the teen staff and taste cheese!